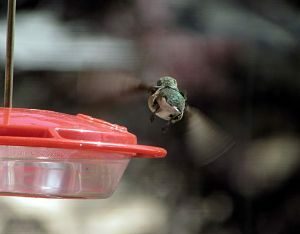 Hummingbirds may be some of the smallest birds in the world, but they’re also among the most active. Flapping their wings at up to 90 beats per second, these tiny iridescent birds build up quite the appetite. According to Audubon, hummingbirds consume half their body weight in bugs and nectar each day, feeding every 10-15 minutes and visit 1,000-2,000 flowers per day. 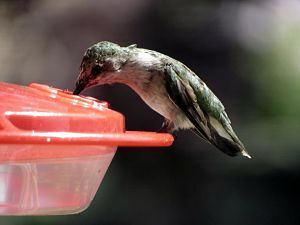 You can help these hardworking pollinators get the energy they need (and attract them to your backyard) by putting out safe and healthy hummingbird nectar that complements nearby nectar-rich plants. Unlike the bright red food you might buy from the store, this homemade version is cheaper and free from any dye chemicals. 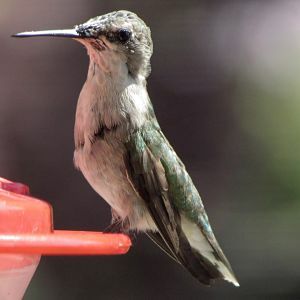 Fill up a feeder with this sweet treat and watch the hummingbirds flock. Hang up your feeder outside and enjoy watching the birds! Remember the ratio 1:4. You can dissolve a cup of sugar in four cups of boiling water and keep in the refrigerator for easier refills. Clean your feeders once weekly with soap and water to stop any mold from forming. Don’t worry about when to stop feeding the birds in the fall. They will still migrate even if you’re feeding them.